Eureka, I’m a genius, the next Einstein! Ok, not so much, but it is an important reminder to me. 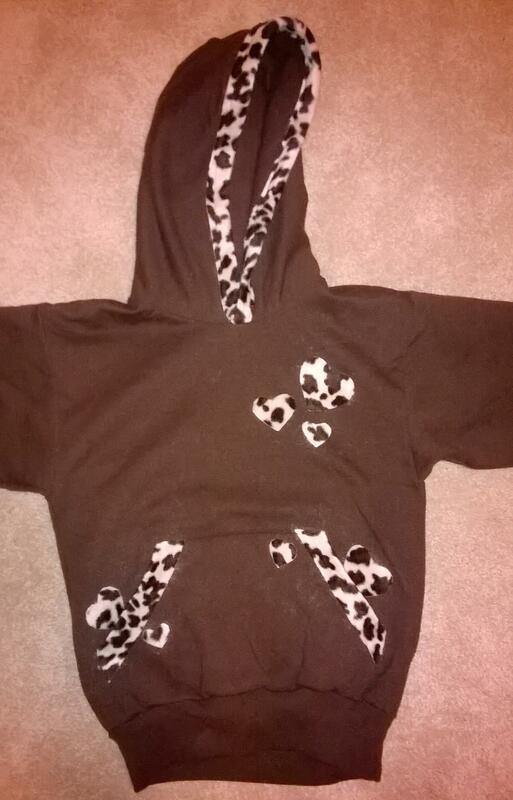 Remember the ugly plain brown sweater I jazzed up a bit? Well, Lisa didn’t still didn’t want to wear it 🙁 . So I asked her, what if I put some more hearts here and here, will you wear it then? The answer was maybe, which is basically a no. Then Mr. M decided it was time to intervene and asked her what exactly needed to be changed so she would want to wear it. Much better result this time, she said the sleeves were too wide and the waistband too tight. Ah, I can fix that. But why didn’t I think of asking her that simple question? This is so NLP, the NLP Metamodel is all about being specific and what questions to ask to get the exact information you need. I couldn’t stand it that I didn’t ask her that. Apparently I need to practice more. I didn’t ask a specific question and therefore didn’t get a specific answer, so the result wasn’t what I wanted. So, I need to remind myself that (specific) Question(s) + Answer(s) = (desired) Result. And so, I went back to my atelier (sounds much better than craft room) and narrowed the sleeves and cut off the waistband and cuffs. 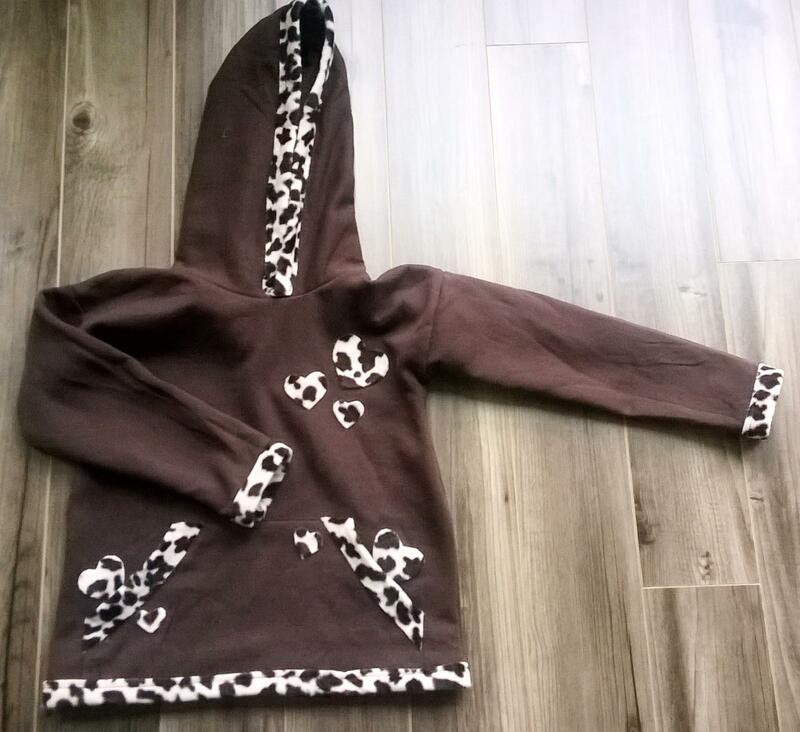 This is the result and best of all, she wanted to wear it immediately after I finished it. Hence my little reminder Q + A = R.
It’s amazing how much 6 words can tell. Of course I had to try it myself. It’s not easy, but it is fun and kind of addictive 🙂 So I came up with two of my own and I’m pretty happy with it for a first try. Bye Netherlands. Hello US. Life 2.0. I love me. How about you? What do you think? Or maybe you have a six word story of your own? I love to hear it! * I got these examples from sixwordstories.net. If we treat people as they are, we make them worse. If we treat people as they ought to be, we help them to become what they are capable of becoming. When I read this quote, I had to think of the Rosenthal-Jacobson study. You have probably heard of this study. In the late 1960’s there was an experiment at an elementary school. The teachers were told that some of their students (their names were revealed to the teachers) were to be expected to excel. In reality these students were randomly chosen. However, at the end of the experiment it turned out that the students that were supposedly better in fact did have better results than their peers. This is what became the Pygmalion effect. It was named after the mythological Cypriote king Pygmalion who sculpted a statue of a woman that was brought to life by Aphrodite. And this study reminded me of a book I recently read. Outliers: The story of success by Malcolm Gladwell. In this book Gladwell describes how a little advantage at the start may end up a very big difference at the end. The little advantage, for example being a few months older and therefore a little stronger and faster, may lead to an other small advantage, getting a little more training, what may lead to a little bigger advantage, getting on a better team, which means more training, getting better and may eventually lead to becoming a professional player instead of being just one of the millions of average sports players. So little things can make big differences. And I wonder, what would the world be like if we all treated ourselves and others with high expectations and love? What if we would treat ourselves and the people we meet, especially children, as the people we ought to be instead of who we are? Being aware of and stimulating our abilities instead of our disabilities and the things we’re good at instead of focusing on our flaws. I realize that it may not always be easy, but the first step is awareness (it took me only 40 years to get there 🙂 ). When I catch myself saying something that I would prefer to say differently, I start over and say it again the way I want to. What ever you choose to say or do, just be aware of the impact it may have, it might just be bigger than you’ll ever know. The other day Lisa was in a school play in which she was a boxer dog. 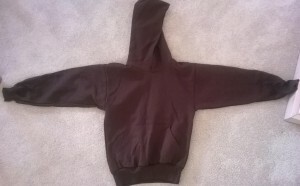 For that she needed a plain brown hoodie. Even though I bought the cheapest one I could find, I thought it was kind of sad that it would only be used for like an hour. So I decided to jazz it up a little so hopefully Lisa wants to wear it. I bought some fabric and started cutting, sewing and glueing. Actually the glueing part turned out to be rather tricky and I spilled some of it on the fabric next to the pocket. On the back it said the glue could be removed when wet, but it didn’t go away 🙁 hence the heart next to the pocket. Fortunately Lisa liked it and she wanted more hearts, so the other pocket got a heart as well 🙂 . 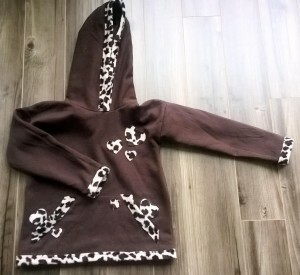 This is how it turned out, hopefully Lisa will wear it. Yesterday I posted a message on Facebook in which I asked people if they might be interested in a meditation session guided by me (by the way, if you didn’t read that, but you are interested, please contact me). Personally I like to meditate, especially when guided. One of the reasons I recently started meditating on a regular basis is to connect to my body and spirit. I have been living in my mind/ratio for a long, long time. And though the mind certainly has its purposes, I think it’s not good to be in that state nearly all the time. For one thing it has tricked me into having quite a few limiting beliefs about myself. For example, I used to have some very limiting beliefs about my abilities to form and maintain relationships. Now I’ve decided to ask myself: how can I do things differently so I will be more succesful in forming and maintaining relationships? One of the things I realised was that I need to be really me (yeah, I know, everyone could have told me that 🙂 ). In order to do that I need to let go of my limiting beliefs and go back to my core and feel and experience who I really am, not who I think I am. It’s not always easy yet, but I do feel that I’m going there. So, when I had several reactions of people who want me and apparently trust me to guide them through a meditation it made me happy. And as a bonus I got reactions of some people I had not spoken to in a long time, which was really, really nice. To me that is a sign that I am on my way to being me and that it’s paying off. Has it happened to you too? Your child has a new pair of shoes and the first day they wear them to school, they’re ruined. Well, it happened to me a lot of times and this week again 🙁 . 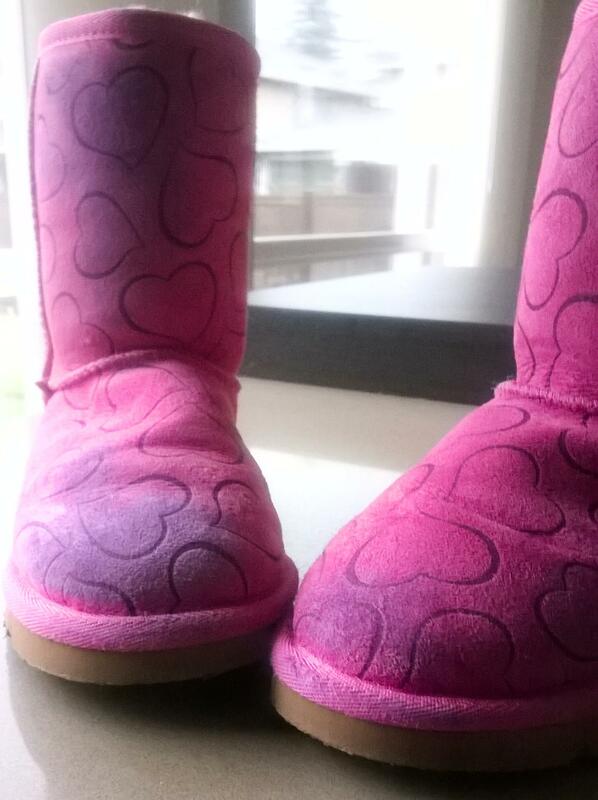 Lisa had new pink boots, and the first day she wore them to school, she came home with purple boots. I hate it when that happens. According to Lisa it is chalk, so I googled binged cleaning chalk from suede boots. So far I’ve tried baking soda and rubbing alcohol, but that didn’t work. If you know something that might help, please let me know. Otherwise, I will try to paint them, but I’d rather not. If you like these quotes, you can find more on my new board “quotes” on Pinterest. Last year in kindergarten Lisa and her classmates made a book with the title: When I grow up… Every kindergartner got his/her own page in the book. On her page of the book Lisa wrote: I want to be a princess. I will have a long dress (okay, her exact words were: I want to be a prisess. I wil have a long dras). It’s wonderful to see the uncomplicated dreams of children, not being limited by all kinds of beliefs about why they wouldn’t be able to become whatever it is they desire. Unfortunately most of us lose the ability to dream freely and adapt all kinds of limiting beliefs that other people in our environment (sometimes with the best intentions) impose on us. Lately I have been thinking a lot about what it is I want to become. First of all in terms of work. I would like to work part time again, but I have no clue what I would like to do. But also in the sense of: what kind of person is it that I would like to be. And I notice that even when I try to just think of what it is I would like to do or how I would like to be(have), I automatically come up with all kinds of limiting beliefs telling me that’s not within my reach. This is one of the reasons I do NLP, to learn some tools to get a different mindset. Some people are naturally very good at it, and some, like me, have to learn it. But the good news is, you can learn it. Sometimes with simple techniques (which does not necessarily mean it is easy to do). One of the things I really like is to try and say things in a positive way. I used to say my glass is half empty and sometimes I still do, but now, when I notice that I do so, I rephrase it and say my glass is half full. Also I try to say the things that I do want instead of the things that I don’t want. I used to tell my daughter: don’t forget, mommy and daddy love you, now I tell her: always remember, mommy and daddy love you. It’s just a small difference but I really like it. So, I think, that maybe when I grow up, I want to be a coach and help people access their resources and hand them tools, so they will be able to improve their quality of life. For now I’ve decided to just learn as much from my NLP training as I can and share my journey with you guys. And you, do you know what/how you want to be? Another makeover project I recently finished is this footstool. Unfortunately I didn’t take a good before picture, because I couldn’t wait to get started 🙂 . 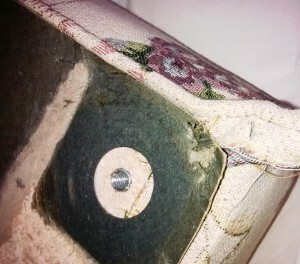 I only have some pictures of the underside of the stool (just in case I wouldn’t know how to put it back together). Well, I think it gives a pretty good idea of how ugly it was. 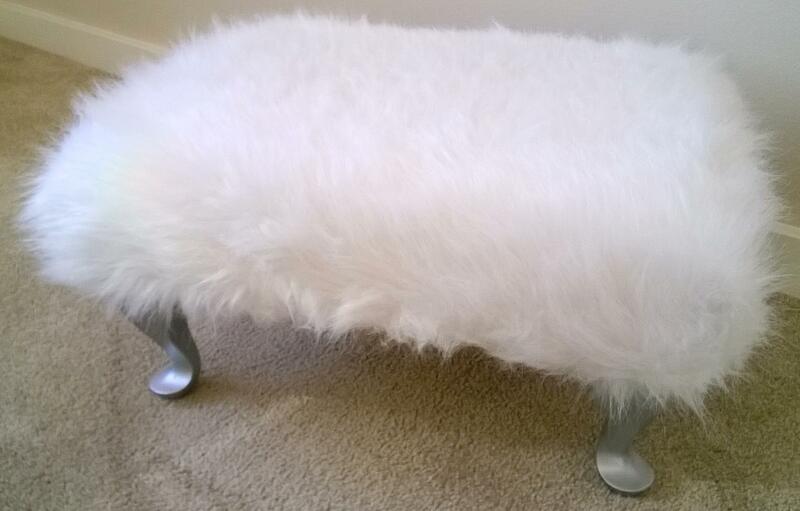 So, I started to dissect the footstool, until there was nothing more left than 4 legs, a piece of wood and some foam. 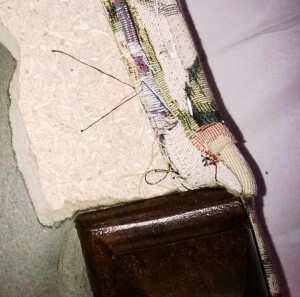 Then I had to put it back together. So, first I put some batting over the foam and stapled it to the underside of the wood. 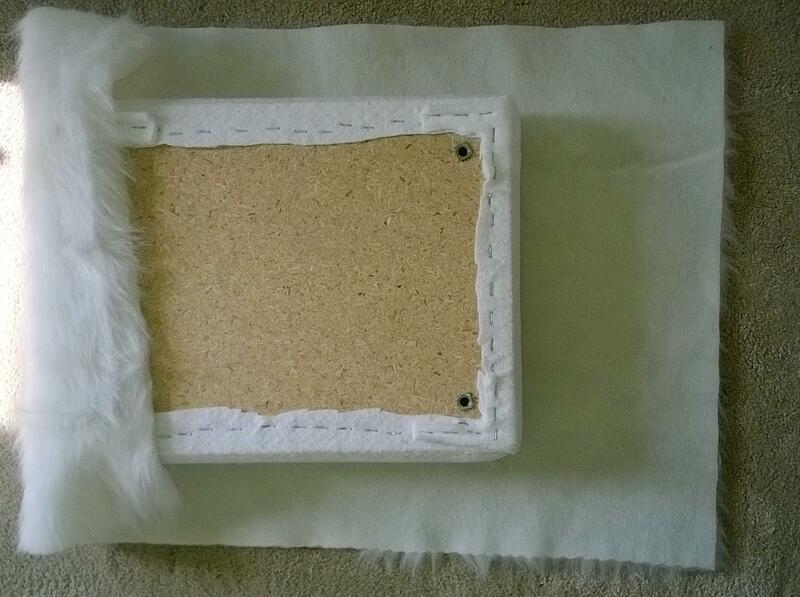 Then I covered it with some faux fur fabric. I painted the legs silver and this is the result.